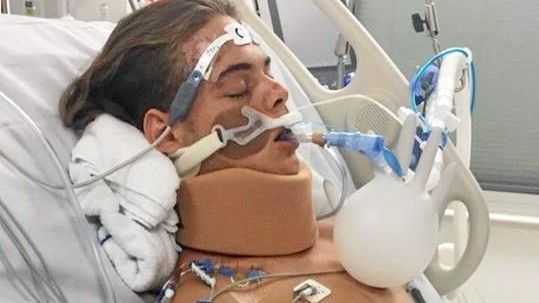 THE SISTER of a Gladstone teenager fighting for his life after being struck by a car on Gladstone Benaraby Rd has started a fund raising page to help her parents through this difficult time. Adam Dalgairns, 17, was taken to Gladstone Hospital after he was struck by a car at Wurdong Heights while walking home from a party early on New Year's Day. He was soon transferred to Gold Coast University Hospital in a critical condition, having suffered extensive damage to his knee and lungs and contracting pneumonia from inhaling water due to his landing face-down in a ditch, according to his family. Mr Dalgairns remains on life support in an induced coma in the hospital's intensive care unit. "His condition keeps fluctuating which is keeping us all on our toes," wrote his sister Jade West-Holmes on the fund raising page. "It kills me and my siblings to see our parents so distraught and stressed about Adam and have them worrying about accommodation, food and general well-being of themselves and the rest of us kids at this devastating time," she wrote. "The added stress as to where they will find the funds for Adam's surgery and hospital care... we have been informed it's going to be a long road ahead. "I know it would mean the (world to) him and us if anyone could help financially, even a small amount."